Once a "New indicator" is selected, the system creates a new indicator file in "~\AppData\Local\JForex\Indicators" directory. The Indicator by itself is a java file, which can be edited in any Java compatible editor. The default indicator is an example indicator, the user can either compile and test the example indicator or replace its code with his own source code and then compile and add it to some chart. Compilation results can be checked in Messages tab. If the compilation succeeds, a "Compilation successful (..)" message is displayed, otherwise, the user gets detailed error messages. 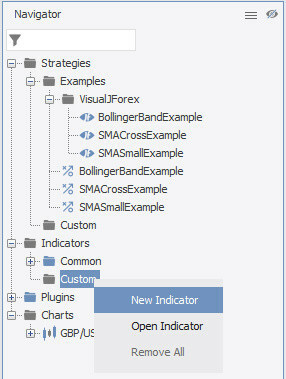 The user can add the indicator to a chart by selecting Indicators -> Custom -> [Indicator name].